A few months ago I was running one of the the Knitting Club workshops and one of the ladies came over and showed me a book of toys and dolls (see right) I had a look through it and found one of the tiny toys my grandmother had knitted us when we were young (the little sleepy mouse in it’s sleeping bag on the cover being one of them). I thought it was cool to see some of those toys again. I took it back to her and she said “nono, you keep it” and I was touched! So I said thank you and took it back to where I’d been sitting for a closer look. And the book, my new book, fell open at a page titled BABY DOLL. I couldn’t believe it! 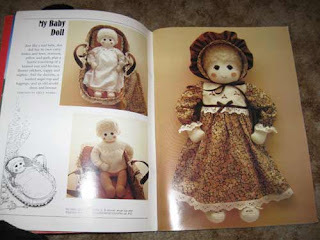 There, on the page of my new book, was one of my very beloved dolls from when I was very young! 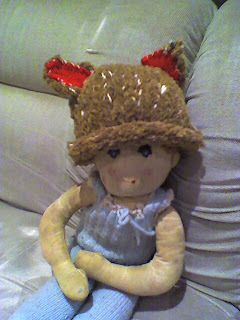 My grandmother had made two dolls, one like this and one in a different style which I loved and carried around for years. One I called Kate, after my best friend at the time, and this one I called Debbie… After Kate’s big sister. Children have a limited scope of imagination sometimes. But I sat with the book on my lap for a couple of minutes, jsut in wonder. That I held in my hands the pattern my grandmother had used to make one of my two favourite dolls ever was incredible, and seemed so co-incedental as to be amazing. I’m currently in the middle of moving house, and I’ve found the box with my dolls in it, which includes the afore mentioned Katie as well as my teddy bear, a portrait doll Nan made of me, and one my mother later knitted when I was all gothic, but no Debbie. It’s got me a little concerned, I’m not sure where she is, or why she’d not be with the other dolls. But last time I remember seeing her was for this picture: I knitted the monkey beanie for a friends newborn, about a year and a half ago and needed a modle. So she must be somewhere. I hope. Looking at this photo, and looking at Katie in the box, my old toys are all a little dirty, or at least, they were well loved by a little girl who was a little messy. So now firstly, I have to find Debbie, and then I have to figure out how to clean them. 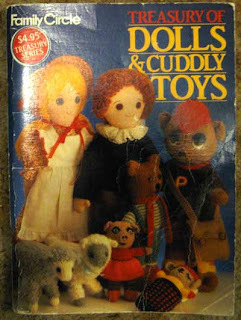 But really, this post was about the kindness of strangers, a lady who gave me a toy pattern book because she had no need of it anymore, and how incredible it turned out that it had been one my grandmother had a copy of, and that she’d made a bunch of the toys in there that I recognised, up to and including one of my two favourite childhood dolls. The world is weird sometimes. Yeahyeah, that's the one. I hadn't seen those pig kids before, but I thought they were too weird! Imagine getting one of those when you were little. That wouldn't give you nightmares…. Next post: Exhibition coming up!